In the everyday medieval world—where life was filled with hardships and dominated by teachings of the Catholic Church—saints were figures of wide appeal and influence throughout society. Derived from the Latin 'sanctus' or 'holy', their title signified virtuous lives distinguished by an all-consuming devotion to God. Whether Biblical figures or common folk who performed miracles and braved persecution and torture for their faith, they were, in death, elevated by the Church to positions of privilege in Heaven, where they could act as personal intercessors with God. As accessible and approachable members of the 'holy company of heaven', they were believed to protect against life's misfortunes—able to heal and perform miracles on behalf of the faithful. Saints were also seen as mentors in spiritual devotion, teaching and inspiring the living with their piety and charity, resistance to evil and heroic acts. As all art was controlled by the Church, religious paintings and illustrations spread the stories of each saint's unshakable faith. In both worldly and otherworldly settings, countless images brought their legends and miracles to the literate and illiterate alike. As most early saints were martyrs (and the day of their arrival in Heaven was celebrated), the saint was often depicted undergoing horrific persecution or at the moment of death. Others scenes would show the saint in serene contemplation or in the company of Heavenly hosts. To allow medieval viewers to quickly identify each saint (there were thousands, both local and universal), the artist included literal elements called 'attributes'—real objects that appear in the story of their lives—and symbols—which represent personal traits or spiritual ideals. Together, these elements identify the saint's torture or martyrdom, miracles they performed and suggestions of virtues or powers they possessed which could be called upon by believers in times of need. In this way, each image included an identifying 'code' for each saint in religious and, later, popular culture. This artistic language remained substantially unchanged over centuries, even as the Church's influence waned, providing a straightforward and common language for all people, without regard to local customs or level of education. In St. Jerome and St. John the Baptist (Masaccio, 1428), part of a polyptych originally in Santa Maria Maggiore in Rome, St. Jerome is represented in a cardinal's red cape and red, flat-top hat, following the legend that he was ordained a Cardinal for his service to Pope Damasus I (though the title of Cardinal did not exist during his lifetime). He holds a copy of the Scriptures (known as the 'Vulgate', the Latin translation he authored) open to Genesis. In his arms is a maquette of a basilica-shaped church, indicating he was responsible for the founding of monasteries in Bethlehem. And at his feet is a small lion, from whose paw, according to legend, he calmly extracted a thorn, after all the other monks ran away in terror. St. John the Baptist is shown with his typical attributes, including a vest of camel's hair, signifying his years in the wilderness, and a cross, here attached to a column ('colonna' in Italian) in reference to Pope Martin V who came from the Colonna family. From the cross hangs a banner reading "Ecce Agnus Dei" (Behold the Lamb of God), John's words as he first saw Jesus approach him. In the detail from The Crucifixion of the Parliament of Paris (van der Weyden, 1452), Saint Dionysius is seen, as usual, in Bishop's garb and carrying his own head. The first bishop of Athens, Dionysius was sent by Pope Clement to preach to the pagans in Gaul. (da Milano, ca. 1350)His success preaching, along with the priest Rusticus and deacon Eleutherius, angered the Emperor Domitian, who had Dionysius scourged, stretched on a hot grill, gnawed by wild beats and tortured on a cross. Sent back to prison, he defied the Emperor by celebrating Mass with other Christian prisoners, which led to his martyrdom by beheading. In The Beheading of St. Catherine (da Milano, 1350), we see the young and beautiful Catherine, a queen of Egypt, who, after dreaming of the Holy Child, decided to be baptized into Christianity. Becoming a scholar of the religion, she confronted the Emperor Maxentius about religious persecution. Taken by her beauty, he tested her by arranging a debate with 50 pagan philosophers, all of whom she convinced to convert to Christianity. Enraged, he had her imprisoned, only to find she'd converted his wife and servants, as well. 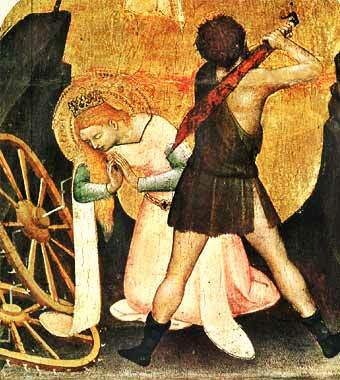 He then built a machine with spiked wheels on which she was to be torn apart. But a flame from Heaven destroyed the machine. Catherine was then beheaded, after which milk flowed from her severed neck. She is usually depicted at her beheading, wearing a royal crown and with a palm of victory, kneeling by remnants of the spiked wheels. St. Peter Martyr (Crivelli, 1476) was a Dominican friar from Verona of great devotion to his faith who traveled widely in Italy, preaching relentlessly against heretics. Despite violent persecution, he continued to denounce those who would not follow Catholic precepts, including two Venetian noblemen who were then imprisoned. Soon after, as Peter traveled a deserted road from Como to Milan, two assassins hired by the noblemen attacked him and his companion. The assassins sunk an axe into Peter's head, but later found him on his knees writing, with a finger dipped in blood, 'Credo in Deum' ('I believe in God'). The assassins then sunk a dagger into his chest. He is always depicted with the weapons of his martyrdom, sometimes with a palm branch in his hands. 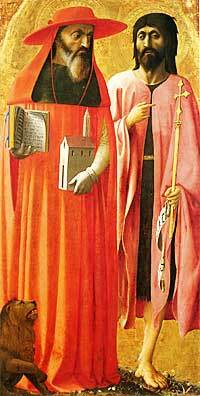 St. Apollonia (della Francesca, ca. 1470) was a deaconess of the Catholic Church of Alexandria at a time when pagan officials ordered the persecution of all Christians. Rather than flee the city, she stayed behind to tend to her remaining congregants and preach her faith. Enraged by this defiance, the authorities arrested Apollonia and ordered her to make a sacrifice to the pagan gods. Instead, she made the sign of the Cross, and the idols crumbled into thousands of pieces. She was then tied to a column and her teeth were pulled out with pliers. Taken to a blazing pyre and threatened with being burned alive unless she recited pagan prayers, she instead broke free of her jailers and threw herself into the fire. 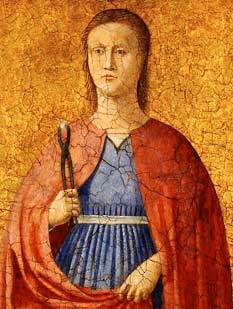 The patron saint of dentists, Apollonia is always seen gripping a tooth with a pair of pliers, and often holding the palm of martyrdom. 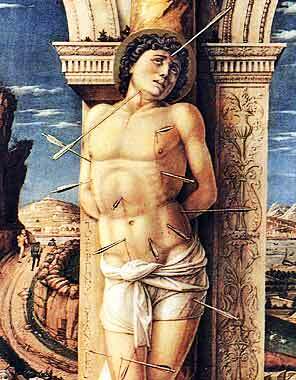 St. Sebastian (Mantegna, 1458) was a young, courageous centurion, a commander of personal bodyguards to Diocletian, one of the last emperors to persecute Christians. Sebastian's Christian faith was discovered when he counseled other officers not to renounce their beliefs, and Diocletian decreed that he be bound to a post and executed with arrows. Pierced multiple times, Sebastian was left for dead, but survived and was nursed to health by the mother of a martyred friend. Refusing to flee Rome, he instead returned to the Emperor, presenting his survival as proof of Christ's power. Diocletian ordered him beaten to death in the gladiator's arena, after which his body was thrown into the Rome sewer so he could not be found—though his body was later discovered and buried in the catacombs. In Christian art, Sebastian is always shown bound to a tree or pole, his body shot through with numerous arrows.